My Kind Of Introduction: KIDS BOWL FREE ALL SUMMER! KIDS BOWL #FREE ALL SUMMER! What child don't love to throw some balls around and go bowling?? Take advantage of this wonderful offer where kids get to bowl for FREE at participating AMF Bowling Centers! 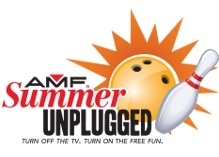 Summer fun is just around the corner, and so is AMF Bowling Centers, Inc.
Sign-up for Summer Unplugged and Summer Pass now! We'll be having Family Bowling Nights more often! !